At left, Mark and Antony at the screening of their video at Washington-on-the-Brazos State Historic Site in Washington County. Tony Cherian, a graduate student in Library and Information Science, and Mark Westmoreland, a graduate student in Anthropology, were awarded the 2002 Zora Neale Hurston Prize for their work in African American folklore. The prize is made by the American Folklore Society. It is given each year to recognize excellent student work in African American folklore and was presented to these students for their video work "Truth I Ever Told." 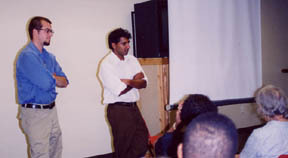 Tony and Mark received the Intellectual Entrepreneurship (IE) Program's Fellowship in "Interpreting the Texas Past" in 2000. They created a project to do interviews with African Americans in Washington County and, based on their oral history work, created a film. The film is to be shown to area school groups and will become a part of the permanent offerings of the Washington-on-the-Brazos State Historical Park. They created a fifty minute portrait of the African American community in Washington, Texas, with articulate African Americans, both teenage, middle age, and elderly, talking thoughtfully about the changes in their rural community. Each of the students in The Project in Interpreting the Texas Past is producing high quality projects that are both meaningful and useful to the historic sites and their communities. They are, indeed, "citizen-scholars."